This quilt was inspired by a piece on the local news. They showed an American Kestrel - the smallest falcon and oh so cute. It's head can stay focused on something while it's body can turn and move. It sort of reminded me of a bobble head. Here is my version of the American Kestrel falcon. I found while making it that it really helped to make my design on paper but then make a overlay on tracing paper so I could get all the little pieces in the right place. This guys eyes are a main feature and putting an eye to much to the left or right will totally make it look off. The sound it makes is sort of a Klee - Klee sound. Next I am going to work on a hummingbird. They are around a lot right now here in Vermont with all the flowers in full bloom and it is a gift to see one. I purchased a couple fat quarters of this gorgous sky/water fabric at the quilt show. Perfect for this sort of thing. Above is my pattern drawn out on tracing paper for placement of all the little pieces. Yesterday I quilted it and here is the back. Next week I will do the reveal after I bind it. And I really scored at the thrift shop with this 3 stooges mug - how could I not buy this? Leanna I thought of you when I saw this, you being the queen of kitsch and all. I can't seem to get enough of making these cairns or rock stacks. Here are a couple that I finished this week. I used the serenity rocks method for this one. Added an interesting stick from the beach at ausable point and some shells. And one using the fusible method with a pieced beach. Gotta love that footprint fabric! The lighthouse is a button. The weather here in Vermont has been extraordinary at least on my days off . I feel very blessed. I made another serenity rocks art quilt this week using my pattern. It's on craftsy here or etsy here in case anyone is interested. The " rocks" are a good take along project for a summer trip BTW. I have to have something to sew by hand on a trip for sitting around time. I just got back from a camping trip on beautiful lake Champlain. Now I'm not usually a camper but this place at ausable point on the NY side is just absolutely gorgous. I get up early to go down to the beach before anyone is up and let my two dogs off the leash to run and play. So fun and the sunrises aren't bad either. I also posted a tutorial on how to put a facing on an art quilt. At least the method I like anyway. You will find it on the top part of my blog. As usual I am linking up with Nina's off the wall blog. I finished the spider web quilt that I talked about here. It's small, about 12" square. I don't imagine one would want a wall full of spider web. After the melted sheer I single crocheted a few different eerie looking yarns and attached them all before adding the binding. The dead things in the web waiting to be eaten are another chunk of yarn and part of a piece of cotton that my mom picked off a cotton plant in Georgia. The spider is a covered button with a bit of batting on it. The kind of button that has a shank thingy like this. After covering I used some floral wire to be the legs and also to attach a smaller button for the head. My grandmothers button box came in handy. I'll bet wherever she is she is loving the fact her buttons are now "spider art". I thought the legs were to skinny and not creepy enough so wound some yarn around them. Now it's a hairy legged spider - Bwwwwwwwwaaaaaaaaahhhhhaaaahhaaaa! 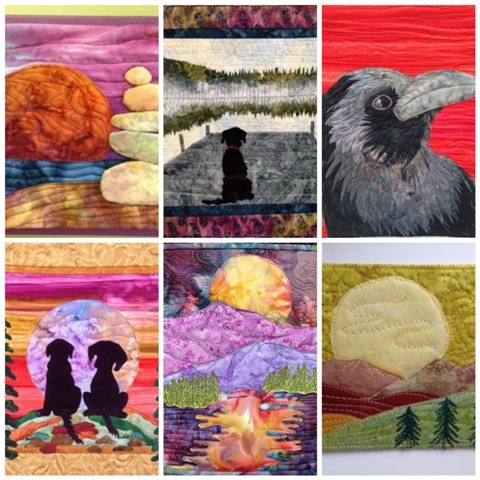 And last but not least I went to the Vermont Quilt Festival last week - awesome quilts. Some were truly jaw dropping. I posted a bunch on Instagram and twitter if you want to see some. You can follow me on Instagram by clicking the button here on the blog to your right. On twitter I am @quiltscapes. Of course the vendors are big part of the show. Here's my haul. Those bags are batik scraps - 3 bucks a bag and each has about 3/4 yd of scraps. Perfect for what I do. A free motion couching foot which I haven't tried yet and Mylar for sparkly quilting. Have to experiment with that as well, so stay tuned for reports on both. Has anyone else used Mylar in quilting?